Dell has recently produced Dell E2416HM G0RH1 24.0″ Full HD 1920 X 1080 Monitor, which is a decent 24″ range full-HD 1080p resolution monitor (it is a huge nice monitor!). A very lightweight monitor, with LED backlighting, great brightness colors, responsive, and most important for most users, it is a very energy friendly, saving so much of your electricity power. It is a big plus that Dell sticks with affordable prices and delivers excellent monitor like this Dell E2416HM. If you are looking for an IPS monitor, this monitor is not for you, but if you are looking for a very nice TN matte monitor, then you should consider this one. With most affordable TN quality monitors, you will not be able to tilt your head and still have a good quality of your screen, but not with this one. This Dell E2416HM does have a decent viewing angle, so you will really need to look at from the side for having a fading picture or text. Before you purchase this, you should understand what connectors your current computer has because this Dell E2416HM comes with VGA and DisplayPort connectors, it does not have HDMI or DVI ports. This big monitor works with both Windows-based PCs or Mac. Computers that have DisplayPort or VGA will be able to be connected to this screen, and also Mac that has a Thunderbolt, which is also a mini DisplayPort as long as you have the cord. Dell E2416HM has so many features, that you will be happy with for about 100 bucks. Big 24-inch screen performance. With this 24″ diagonal LED backlighted screen, you will be able to maximize your productivity, in additionally this screen has anti-glare or matter with the resolution of 1920×1080 full-HD. It comes with a stand and viewing options. 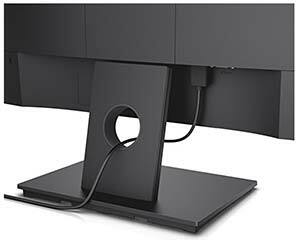 The monitor height is not adjustable, but it can perfectly tilt at 5 degrees down or 21 degrees up. There is also a nice sized hole in the base, so you can run your cable in there. And because it is very light, you can easily move it around in your home or office next to a router for example without help. Easy to use. Ability to fine tune your monitor with easy to use button system. The power button on the bottom right-hand corner, preset modes,brightness scales, visual adjustments, energy use bar. With touch sensitive power on/off button, you can just touch it, and the round LED light will be up, to indicate you that the monitor is now on. Energy star monitor. This monitor, even with 24″ big screen, it uses less energy than other monitors on the market, an energy efficient device. If you have a laptop or desktop that have VGA connector, this Dell E2416HM is a good inexpensive product for you, the specs, quality of the screen and how lightweight this product has, definitely a recommended monitor.